The kriyāyoga of the Himalayan Mountains is a surviving ancient practice of the adept (siddha) lineages of Himalaya and is currently overseen by the great siddha Tryambakanātha (also spelled as Tryambaknath) who is also popularly known as Mahavatar Babaji. The nath adepts mostly roam and meditate in caves that are higher in altitude than the easily accessible ranges of the Shivalik mountains. In this context, the Himalayan terrain of the nath yogis is typically divided into three levels: the lower Himalaya up to about 9000 feet; the middle ranges beyond 9000 feet up to about 18,000 feet; and the high Himalaya from 18,000 feet measuring up to the height of Mt. Everest (the Sanskrit name of the tallest mountain is Vyomakūta). The Himalayan nath siddhas are often identified from areas corresponding to the nath centres that are also well known as the principal shrines for pilgrimage. Among these six major centres, Amarnath, Kedarnath and Badrinath are inside the current borders of India. Whereas, Pashupatinath and Muktinath are in Nepal, and Kailashnath is assigned to the Kailash and Manasarovar area. In some traditions, Muktinath is not grouped together with the other five centres of nath siddhas. The entire kriyā system of meditation including kriyāyoga was revived and disseminated by the mahā-siddha of the current times, Tryambaknath, who is based out of the GauriŚankar Pīṭha located in the hallowed Badrinath of the Garhwal region in the northern state of Uttarakhand, India. Tryambaknath is deemed to be a direct descension or an incarnation of Lord Bhairava. He was trained by rishi-sages, first by Bhoganath and then by Agastya, and perfected the result of kayakalpa that involves intricate and rigourous yogic practices while using siddha herbal applications. 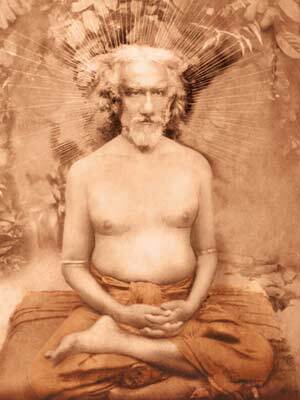 Having transmuted his body he is known as a kalpayogi, because of his triumph over death. His sister Nāgalaxmi Devi who is lovingly addressed as annai, meaning sister in the Tamil language, is a descension of Ajāmilā Devi of the higher world. Besides overseeing the teachings by his sister, and the practices of his disciples, Tryambaknath often roams around with the nāga adepts. These nāga adepts have exhausted their experience of life and thereby have overcome the pangs of pleasure, pain and stupefaction. The nāga adepts are also revered for their extraordinary control over the five elements, and are identified by their humanoid features. Other esoteric kriyā practices are attributed to lineages of the siddhashrama tradition nestled and tucked away in the Shangri-La type caves in the high mountains. Herein adepts identified as muni and rishi guide advanced meditation practices to chosen yogis who have gained access to such enclaves by the virtue of their own merits and ardent meditative penance. Even though some of these practices have been leaked to a few outside aspirants who have tried to write about the teachings, these meditation techniques hitherto remain esoteric and largely inaccessible. The meditation techniques revealed by Tryambaknath are taught through the tradition of a kriyā initiation by Himalayan yogi-monk Swami Vidyadhishananda based on a traditional teacher-pupil tradition. A direct and immediate spiritual experience is effected through the initiation blessing. There is no institutionalized promotion or public dissemination of these kriyā techniques. Therefore, there are no public programs specific to kriyāyoga or other Himalayan kriyā meditation. Herein the techniques are neither for sale nor are the practices trivialized by casual sharing with a seeker. The practices for monastics, reclusive trainees and unencumbered aspirants are more exhaustive and involve several other kriyā techniques in addition to a strict plant-based diet that enhances vitality by using tonic herbs recommended by the siddha tradition. 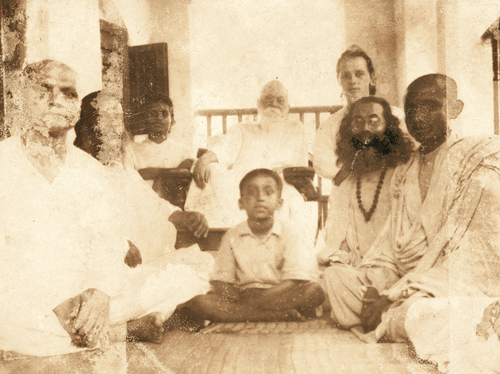 Whereas the kriyā meditation practice taught to individual aspirants or householders mirrors the techniques structured by the polestar of kriyāyoga, Shyamacharan Lahiri Mahashaya. 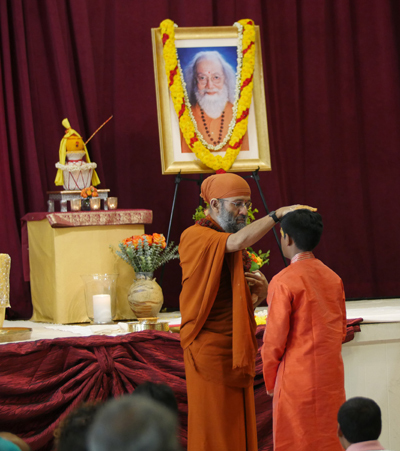 Initiation is offered on a one-to-one basis to selected aspirants who follow a process of learning about the lineage and the heritage, and thereafter commit to this daily practice with earnest intentions. Understanding the principles of vegetarianism, inculcating the value of a cruelty-free plant-based diet, and emulating the siddha advice for pranayama practice, are essential to developing a persistent daily rigour. Those who follow the householder tradition of kriyāyoga are aware of the teaching dissemination by the great nath siddha Tryambaknath to Lahiri Mahashaya during the 1860’s, near the Dunagiri Harapriya Devi Temple in the Kumaon mountain ranges. The original Gagas River, named after sage Garga rishi who had his ashram nearby, where Lahiri Mahashaya underwent purification before his initiation is now all but a trickle of water near its source. However the legacy lives on through the original kriyayoga techniques that have been disseminated, practised and experienced by sincere aspirants and ardent meditators of this path. His Holiness Swami Vidyadhishananda hails from lineages of meditation masters from Himalaya who are known for their combination of rishi sagely scholarship and nath yogic practices. 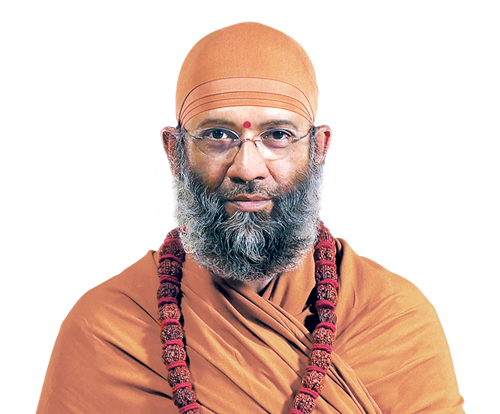 He trekked and retreated into high Himalayan terrain of the nath yogis after the passing of his monastic master, His Holiness Swami Hariharananda, in December 2002. Thereafter, Swami Vidyadhishananda was directly guided by the rishi sages to come down to the plains and offer his services both in India and the West, and only retreat into Himalaya periodically. His Holiness was directed to disseminate the entire range of Himalayan kriya meditation techniques in September 2005 after descending from a retreat into the Himalayan Mountains. 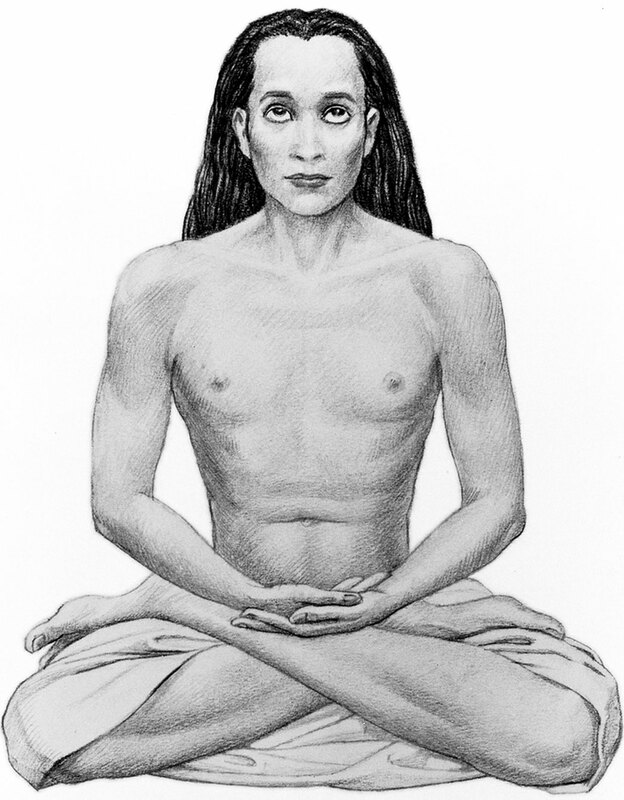 Since June 2011, Tryambaknath (Mahavatar Babaji) has been regularly conferring his blessings and has been directing Swami Vidyadhishananda to structure the teachings of kriya meditation techniques. As a result, since November 2013, the four kriya paths including the original kriyayoga techniques are being disseminated as per Tryambaknath’s system of teachings. His Holiness offers initiation into these original mountain path kriya meditation techniques to sincere seekers. Deeply connected with the ascended masters, siddhas, rishi sages and higher gods, Swami Vidyadhishananda teaches authentic time-honoured meditation techniques preserved by the Himalayan adepts. His Holiness was awarded the degree of Mahāmahopādhyāy (DLitt et Phil) by the university system in India due to his scholarly and meditative interpretation of Sanskrit literature. Shaped by the rugged yet enchanting Himalayan terrain, His Holiness brings us the sublime peace of the mountains. Sitting in a steady and aligned posture with neuromuscular relaxation (slackened effort of muscles). Developing the focus in the midpoint of the eyebrows (bhrumadhya), and feeling a comfortable countenance wherein the physical body feels as if anaesthized or earthed. Physical disturbances are overcome. Controlling the ujjayi breath and its pauses using the core in front of the bladder (fingers interlaced in front of the bladder); the core is distended when inhaling and pulled in when exhaling (the centre of the core is five fingers below the belly button). Feeling the ujjāyī breath in the pelvis by full activation of myofascial psoas (this fuller psoas range allows unhindered movement of the diaphragm, and is further optimized by the physical aspects of kriyā–mahāmudrā practice). Refining the ujjāyī breathing while reposed in the midpoint of the two eyebrows, making the breath subtle and long with no struggle during the short pauses. Directing from within the midpoint of the eyebrows the subtle ujjāyī piercing the chakra-discs along the hollow spinal tube (synchronized with Ong (Oṃ) implantation). The kriyā-prāṇāyāma falls apart when steady repose in the midpoint in between the eyebrows is lost. 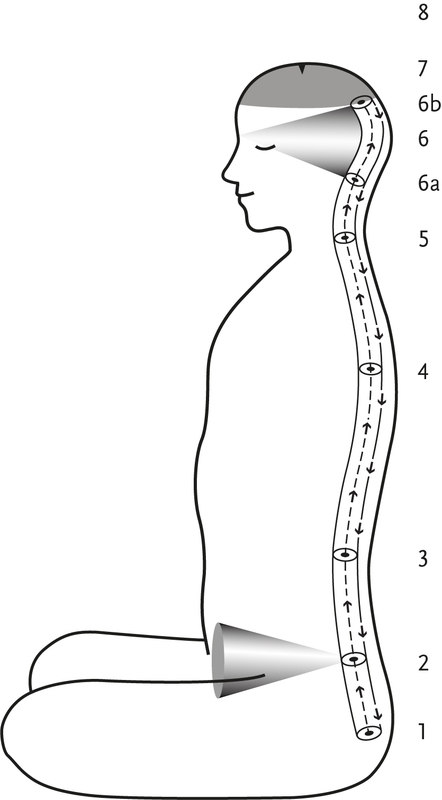 The pranayama can be thus directed from mūlādhāra (root-chakra) to mūla nāḍi (posterior fontanel) extending from medulla alongside the back of the head as shown in the animated diagram at the bottom of this page. An alternate route of guiding prāṇa from the medulla to the midpoint of eyebrows is also taught. However the diagrams only show the mūla pathway to the posterior fontanel. 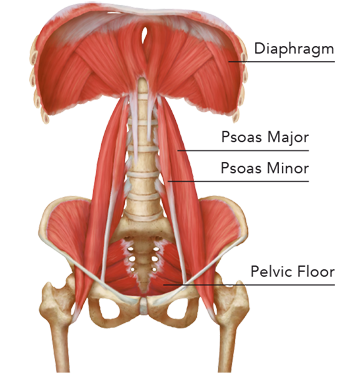 Kriyā- prāṇāyāma properly utilizes the myofascial psoas, a deep-seated band of muscle that connects the diaphragm, spine and pelvis. Activating the psoas allows for a three-dimensional cylindrical breathing. The breath can then be controlled by breathing from the core, and prolonged using the ujjāyī method of prāṇāyāma. This thoraco-pelvic breathing allows one to feel the breath down to the pelvic floor. The diaphragm is properly utilized thereby releasing tension from the sternum. This foundational breathwork is needed to fulfil the intended goal of guiding prāṇa in the spinal tube. In kriyā breathing prāṇa is guided upward along the centre of the spinal tube during inhalation, and guided downward along the back of the spinal tube during exhalation. Besides the yoga-vinyāsa sequence of pavana-muktāsana technique, the kriyā-mahāmudrā technique also activates the psoas. Special techniques have also been systematized and revealed by Tryambaknath (Mahavatar-babaji) that are known to be the surya-kriyā techniques. The system includes sun gazing methods along with related mudrā, prānāyāma, and yoga-vinyāsa techniques, practised in tandem with the sunrise. Open-eye meditation using śāmbhavī-mudrā is applied with great care instead of direct sun gazing when the sun is above 15° to avoid any UV damage. All such practices can only be undertaken when learnt properly from a well-practised spiritual master or an adept. Perception of inner sound and light along with subtle internal sensations of prāṇa is an integral part of the practice. This perception of the light, vital energy and sound becomes distinct right from the initiation process and is ascribed as aum containing the three parts a, u, m, respectively. As per Sanskrit rules, this primordial current is represented as the Oṃ because the sound partitions au combine thus. When pronouncing or ruminating on Oṃ, the ending is a nasal sound as in ong. Thus the repetition of this ong in a heartbeat rhythm yields the melody of the sound gong, as in a resonant gong with a nasal n sound. This clarifies how the Oṃ rumination is implemented in kriyā practice. The initial rumination and thereafter a heightened listening of the internal variations of the Oṃ sound is distinctly different from tinnitus. Internal sound rumination is a quieting withdrawal that guides the mind to a suprasensuous absorption. Whereas tinnitus is an unpleasant sensation and often has erratic components. Meditators deem tinnitus to be unassociated with the inner ear, and not necessarily connected with the auditory cortex either. According to the meditation paradigm, tinnitus is the sound perceived due to the valiant cry of the neurons in the brain which are struggling to communicate due to lack of vital nutrients often related to the gut microflora and constitutional deficiencies. Kriyāyoga routine entails a nighttime listening practice of Bhramarī that includes sounds from insect drone (jhilli), flute, thunder, bells, metallic cymbals, trumpet, drum, etc. These are perceived knowledge as in an awareness of these sounds heard internally, albeit in a subtle sweet experience of revelation that fortifies the meditation practice. The series below is a compilation of videos based on yoga philosophy. Some videos are offered free, while others are part of our subscriber content. The lock symbol in the right-hand corner denotes subscriber-only content. The series below is a compilation of videos designed to prepare a seeker for the path of formal initiation. Some videos are offered free, while others are part of our subscriber content. The lock symbol in the right-hand corner denotes subscriber-only content. A course of study is recommended to prepare for the practice of Kriyayoga. Appended below are recommended study materials and guided practices available online. Read the description text for each recording to learn the specific practice related to each frequency of Ohm. Four-part video series introducing ujjāyī breathing, known as the “breath of victory”, which is the foundation of kriya practices. This set of short videos (less than 5 minutes) gives the basic foundations of how to properly sit and practice pranayama. The rigourous and yet intricate steps need to be learnt properly under direct guidance in an ambience conducive to deep meditation. The initiation process is complete when all the techniques are memorized and verified from practice. The techniques can grip an ardent meditator and thereby lessen the application of rigour, but only after the correct understanding has dawned and the right set of circumstances has been achieved. There is a good explanation for those more inclined to grasp the physical aspect instead of just relying on the subtle work of prāṇa in the suṣumnā nāḍī, (physical counterpart is the spinal cord). The techniques of kriyāyoga use subtle ujjāyī pranayama that recharge the blood and the cerebrospinal fluid with vital energy infused in the correct nāḍī circuit (subtle energy pathways). The group of techniques applies particular mudrā (postures that retain and balance prāṇa) when the internal mental rumination on the primordial sound syllable is synchronized with the perception of prāṇa. Combinations of micro-postural movements and mental strikes define each mudrā. Oxygenation is increased in the body by synchronizing the kriyā internal breath with rumination on Oṃ. Correct chakra piercing is made possible by the repose in the midpoint of the eyebrows. When breathing and quieting the mind become part of the same effort, additional variations of each mudrā can be integrated. The subtlety of understanding which techniques balance which of the five prana, and how the knots are unravelled, has to be experienced while developing the practice. The prelusive yoga-vinyasa-krama and other pranayama techniques such as surya-bhedana, mūrchā, and alternate nostril nāḍī-śuddhi are not mentioned herein. Instead the following summary focuses on the core technique structure sequence of 1st level kriyāyoga. Oṃkāra-kriyā is taught only in the 2nd level kriyāyoga as per the tradition. While sahaja-karma and prāṇa-karma are routinely implemented by all meditators, kūtastha-karma is only undertaken by those practising higher levels of kriyā. Mahāmūdra technique is usually progressively built into 24 per day (two separate sittings are allowed for this practice). When the breath has attained a calm balance due to the assimilated result of other techniques such as kriyā-prāṇāyāma, yoni-mudrā is gradually extended to 192 Oṃ ruminations during a breathhold following a kriyā inhalation (kumbhaka). This breathhold duration of 16 rounds of 12 count is often approximated to a count of 200, and this practice obviously requires holding the breath without any struggle. The after-effect poise of kriyā practice aptly called kriyā-parāvasthā wherein there is no urge to breathe manifests a state of the mind identified with the term Krishna or devoid of all urges and chatter. Krishna is also the name of iśwara (Lord) whose namesake mantra is invoked in the higher level kriyāyoga practices. Before starting the kriyāyoga practice sequence, additional preparatory breathing practices of trimātrika-kumbhaka-prāṇāyāma (alternate nostril 1:3:2), suryabhedana-prāṇāyāma (right nostril 1:4:2) and mūrchā-prāṇāyāma are integrated as per the foundational breathwork routine, warm-up and energization. Himalayan yoga-vinyāsa-krama practices, whereby movement of yoga postures are synchronized with and led by ujjāyī breath, are additional practices recommended for an ardent practitioner who is intent on integrating various aspects of Tryambaknath’s teachings. 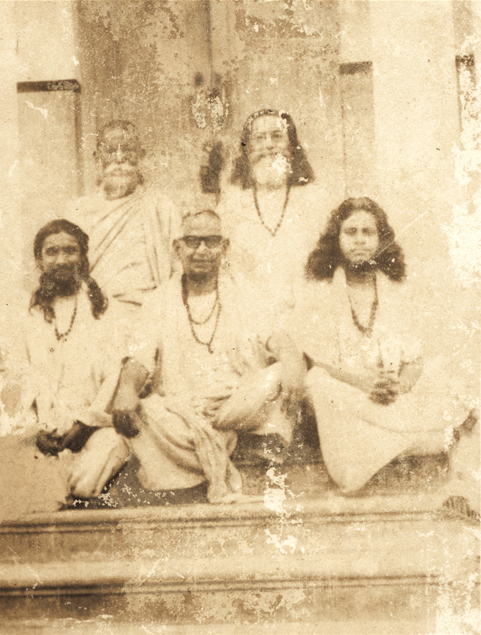 HH Swami Hariharananda (Top Right), HH Swami Satyananda (Top Left), HH Swami Narayan Giri (Bottom Left) and HH Swami Premananda (Bottom Right) sitting on the stairway leading to HH Swami Sriyukteshwar Giri’s samadhi temple. 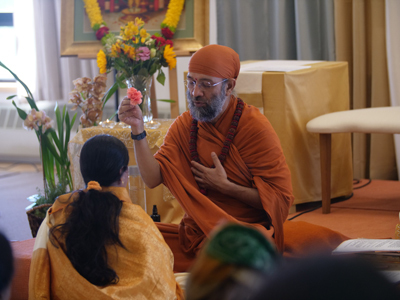 Level-1 initiates complete four stages of rigour (see right column) under the direct guidance of His Holiness Swami Vidyadhishananda at dedicated retreats which are open to kriyāyoga initiates. To better understand the notes for each stage, which use terms such as chakra-disc and spinal tube, please refer to the video animation which shows the KP3 breathwork. The animation shows KP3 which consists of a 20-second inhalation followed by a 20-second exhalation while guiding prānā between the tailbone and the posterior fontanel. One set of KP3 entails 12 consecutive breaths without struggle in about 9 to 10 minutes. This amounts to about 45 seconds per breath matching the pulse of the cerebrospinal fluid. Mastery of KP3 allows implanting the mentally recited Ong (as in song or gong) in the conceived chakra discs. Ong is an alternate representation of the Oṃ sound. Kriyā-prānāyāma level 3 (KP3) entails a 20-second inhalation or exhalation as prana is guided between the tailbone and the posterior fontanel. One set of KP3 entails 12 consecutive breaths without struggle in about 9 to 10 minutes. This amounts to about 45 seconds per breath matching the pulse of the cerebrospinal fluid. Mastery of KP3 allows implanting the mentally recited Ong (as in song or gong) in the conceived chakra discs. In contrast KP2 is based on 100 breaths per hour while KP1 is based on 120 breaths per hour and is for a novice. Correct practice of kriyā-prānāyāma infuses prāna into the susumnā nāḍī to attain a momentum of habitual engrossment (samāpatti) ultimately bringing about the after-effect saturation (parāvasthā). The meditator further undertakes subtle mental kriyā exercises following the after-effect poise. This kriyā-based approach is distinct from other prāṇāyāma-based meditation practices. Moreover this synchronized practice using breath, light, sound, and subtle feelings (subtle movement sensations) constitutes an internal mindful action (kriyā) that brings about poise and alacrity. This approach is distinct from sitting meditation where one observes and releases subtle desires by minutely watching the breath while bearing through distractions to repose in silence.